Serums are one thing i have added quite late in my beauty routine. Mostly it is suggested that one should start using serums, eye creams or other anti aging products in their early 20's to avoid age signs for longer in their life. I do not suffer from any major aging signs but because of extremely dry skin i have some laugh lines around mouth which needs attention. Recently i got the chance to test Reviv Serums TelomErase Serum and i have been using it for more then 2 weeks. Today i am going to share my thoughts that whether it was effective or not. The first product of its kind with three proven age-erasing telomere targeters: Cycloastragenol + Renovage® + Telosomyl®. The latest in cosmetic chemistry spotlighting telomere stabilization. This serum comes in handy pump bottle. The original bottle is large and have black color. I got the two 5ml sample size bottles which was enough to be used for one month. 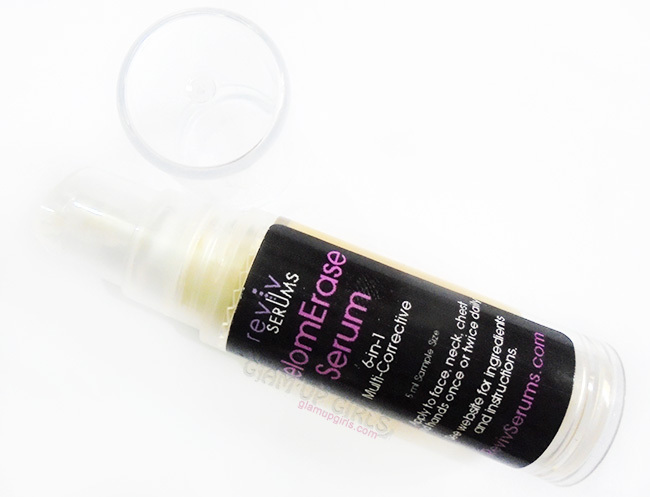 The serum have dark yellow color which on application is transparent. The formula is little thick and applied easily on skin. I need two pumps for my whole face at one time. I have used this serum for more then 2 weeks and 2 times a day, in morning and at night. The formula is claimed to be moisturizing and i have found it to be true. I have very dry skin and once applied on whole face it doesn't dry out skin at once but after an half hour i have to use some moisturizer to keep my skin hydrated. I dispense out product in 2 pumps on my fingers and spread on my skin lightly. It absorbs in the skin quickly but still i leave it few minutes to completely absorb before i apply any other product. In the first few days i did not notice any visible difference on my laugh lines or pores around the nose but after 1 week i felt some betterment in my skin. It felt smooth and for my surprise there were no dry patches on my skin even i have used less amount of moisturizer then usual. The skin looks more healthy and glowing. 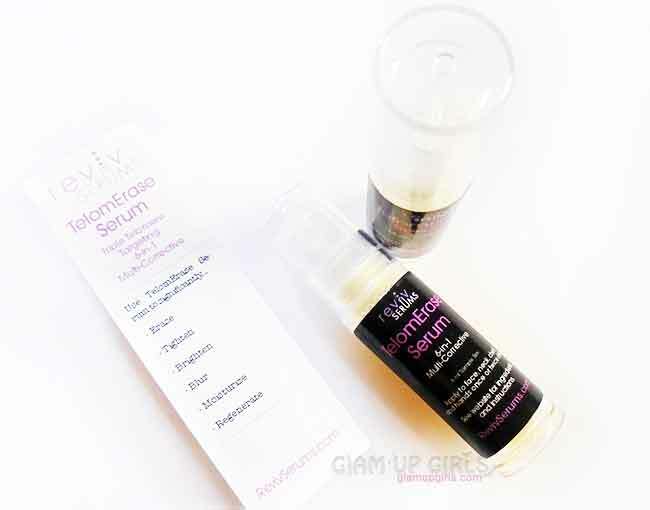 I must say it is not until i have used this serum, i realized that my skin was little dull. After two weeks i have noticed that there was some improvement in my laugh lines. They were not completely gone felt better then before. I can assume that if you really want to improve your skin texture and want to reduce fine lines, you have to be regular and patient for better results. It is suggested to use this serum continuously 3 months regularly and then reduce its usage after your desire results. Overall i really liked this serum, it really improves the texture of skin and by using regularly it can definitely reduce the fine lines and other aging signs. 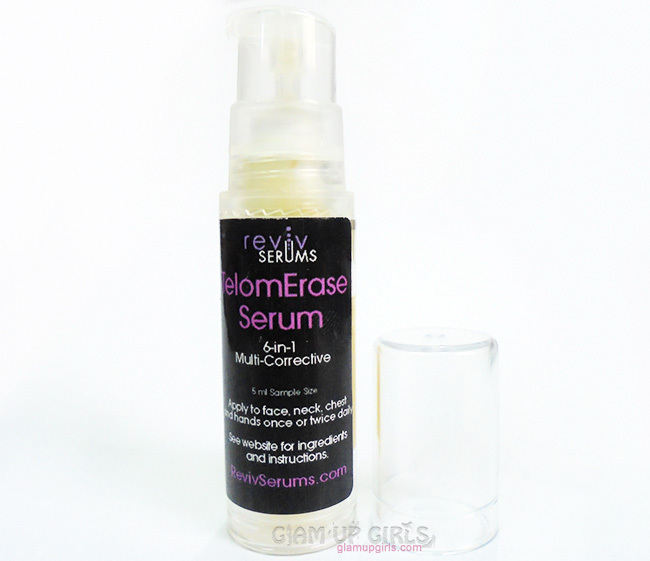 TelomErase Serum is available at Revivserums.com. You can get 10% off on this serum by using discount code TIGHT10 at checkout. This code is valid till December 31, 2015.